J. Henry Muzzy wrote from Lawrence, Kansas Territory to Eli Thayer in Worcester, Massachusetts. Muzzy informed Thayer that free state supporters in Kansas were not, as Thayer had predicted, discouraged by James Buchanan's election as president in November 1856. He observed that the territory had been quiet during the winter of 1856-1857, but warned that the "ruffians" likely would engage in efforts during the spring of 1857 to discourage eastern emigration to Kansas. 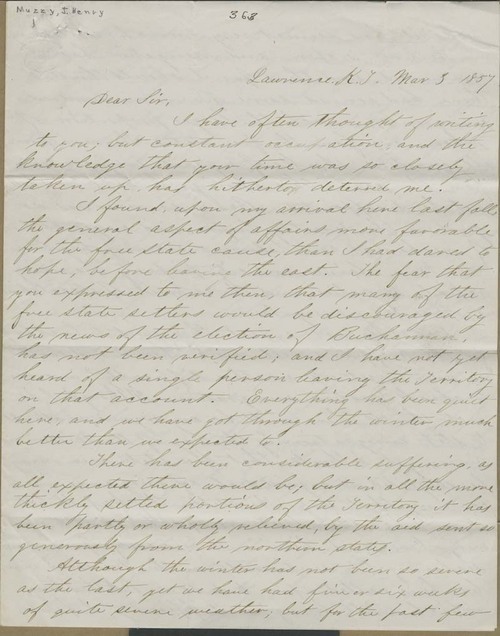 Muzzy also commented on the dilemma that free staters faced in deciding whether to pay the taxes levied by the proslavery "bogus legislature." He and his fellow free state supporters were not inclined to pay taxes imposed by a "foreign power," but they also realized that if Governor Geary called in U.S. troops to enforce the law they would have no choice but to pay. Muzzy concluded by stating that he was thankful for the end of the "reign of Frank Pierce," contending that "any change at Washington can hardly be for the worse."